From ancient times, Indian philosophers believed that except ether or space, all other elements were physically palpable and hence comprised of small and minuscule particles of matter. They believed that the smallest particle which could not be subdivided further was paramanu,a Sanskrit word.Actually,Paramanu is made of two Sanskrit words, param meaning ultimate or beyond and anu meaning atom.Further,the world came to know about nuclear power and atom bomb only around 1945. But the concept of atom bomb was sung 1500 years ago,When a tamil poetess wanted to praise Tirukkural, what she said was this:It is like cramping seven seas in to a single mustard seed. The meaning of Kural is vast. 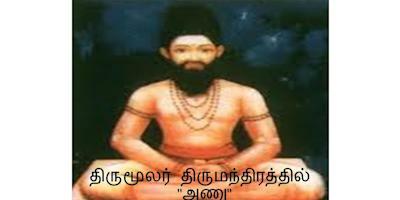 But poet Tiruvalluvar put seven seas in to one mustard seed was the message given by this poetess. Why should he sing about putting seven seas into one tiny seed? Will the Tamil world understand such a simile without some knowledge of huge power in tiny things? Will they knew that if one tiny seed is split into,energy equal to seven seas will be generated? "Thiruvalluvar pierced an atom and injected seven seas into it and compressed it into what we have today as Kural." Avvaiyar might not have known the current "atom" in the strictest scientific sense. by அணுவைத் துளைத்து ஏழ் கடலைப் புகட்டி (புகுத்தி?) (aNuvaith thuLaiththu Ez kadalai puguththi), she just meant to indicate the smallest possible size in which matter can exist. Only the size has been redefined continuously with the advent of science. "சாணிலும் உளன்;ஓர் தன்மை, அணுவினைச் சத கூறு இட்ட கோணிலும் உளன்"
Also,Kambar writes about Lord Narayana’s Narasimha avatara and recounts how Prahlada is taunted by his father Hiranyakasipu. The asura, Hiranyakasipu, asks his son Prahlada where Lord Narayana resides. Prahlada replies that He resides not only in an atom, but if an atom were to be split into a hundred parts, He would still be in every one of those parts.The term "atom" however should not be conflated with the concept of atom as it is understood today.But if you read the Another old Tamil poem which says that one mustard seed has 32768 anu (=8 to the power of 5 anu[atom]). Though their atom is very different from what we read in Today’s Physics book about Atoms,atleast they knew smallest measurements which others did not at that time in the history . The size of Jiva is that one of part Of the one hundred thousand." 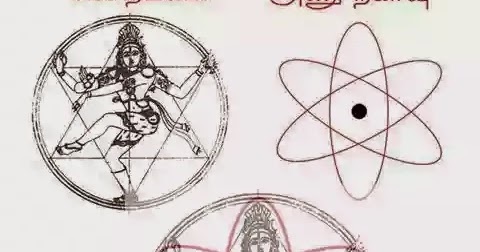 now again considering a resulting single part (i.e.,) 0.000001 mm , dividing it with 100,000 as per his saying results in the size of Shiva (PARAMANU- the master atom) or a Atom's atom . Another Thirumanthiram 1628,says that: the one who is dissolved in everything in this world and seem as if he is not there anywhere and even not visible to common eyes , who looks in golden colour with shagginess of hair, he will not be visible until someone in deep search of him, who will attract everyone like a glittering white moon.now check the images of Higgs Boson particle . Everywhere you see is a Golden flame which looks like shagged hair around it..! Do hasten and Him adore, He, the mighty one of the white moon crest."